This is the first in a series of planned improvements to the Charter Hall as part of the Corn Exchange ‘SOUND AND VISION‘ Project. 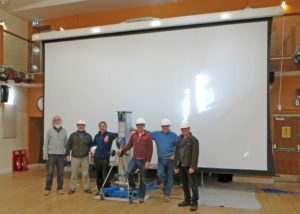 Funding of the screen was by Screen St Ives (thanks to the cinemagoers) and ACE, Friends of the Corn Exchange. We greatly appreciate the important engineering and purchasing assistance and sponsorship that we received from two St Ives businessmen: Mr Dennis O’Carroll, proprietor of Abbotsbury Engineering Ltd and Mr Simon Hepher, proprietor of Hephers Electrical.